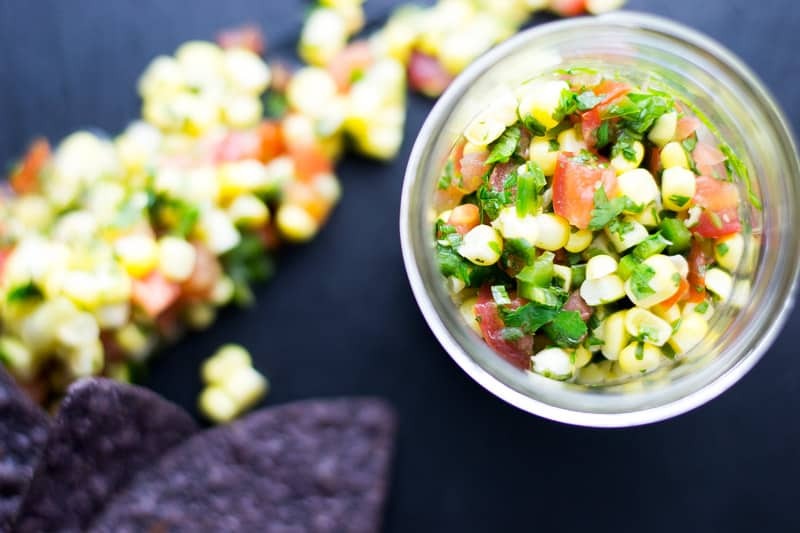 Light and refreshing, our Easy Sweet Corn Salsa brings the light side of Mexican cuisine to any dish. Mexican dishes, for the most part, are pretty rustic, but some require a lot of work to prepare. 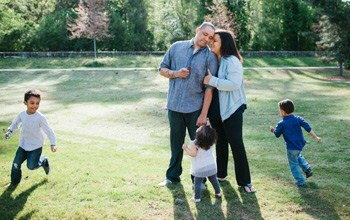 It’s not just about throwing all the ingredients in a pot and walking away. There are peppers to roast and grind, sauces to nurse and bring to life, tortillas to pound out to perfection. And just try to make enchiladas while attempting to keep your kitchen clean. But I got a quick and easy Mexican salsa dish that’ll have you in and out of the kitchen in under 1o minutes. This Easy Sweet Corn Salsa tastes bright and fresh and adds a classic Mexican flavor to any meal. There are combos of ingredients that when prepared together automatically create the base of a regional cuisine. 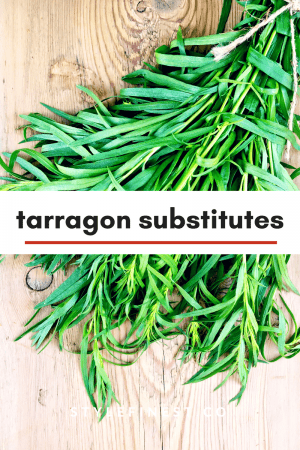 Katherine put together a handy list of essential ingredients by region that you should check out. But as for Mexico, jalapenos and lime blended into any dish bring both heat and tartness. I decided to use sweet corn as a base because our local farmers’ market (not like a traditional farmers’ market but a massive warehouse with the freshest produce, proteins, dairy and dry goods in Atlanta), had huge bins full of unshucked corn that I couldn’t pass up. And a quick peek revealed juicy and plump kernels. I knew the jalapeno and lime would make the corn sing, but it still needed some chopped cilantro to bring out a herbaceous flavor. Most of the salsas I make are the denser, spicier varieties that work very well on grilled and charred proteins. Plus both Katherine and I like salsas that are both spicy and hot. But we’re smack in the middle of summer, and I needed to escape the grill for a bit to make a fresh and light condiment. To finish the salsa, I added diced Roma tomatoes. Make sure they’re very firm, so it has a similar density to the corn. 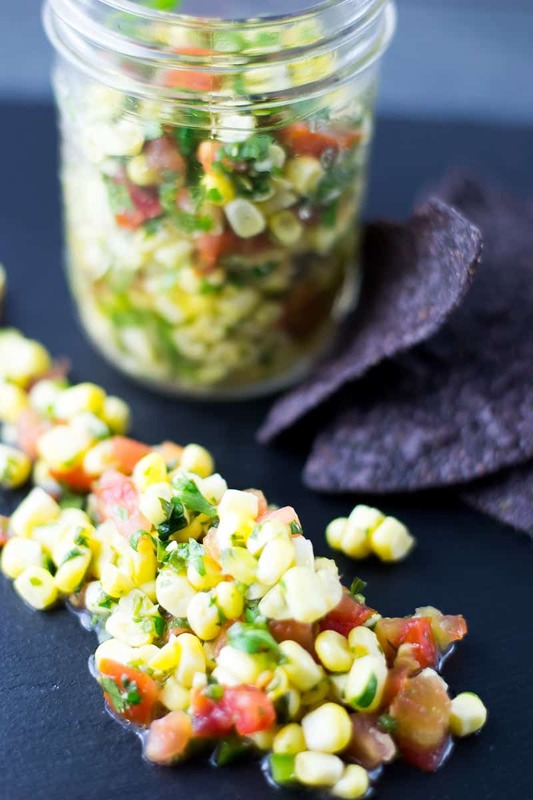 The best way to enjoy the corn salsa is to refrigerate it for about an hour before serving. Crisp and refreshing, it’ll settle in well as a side or taco topping. 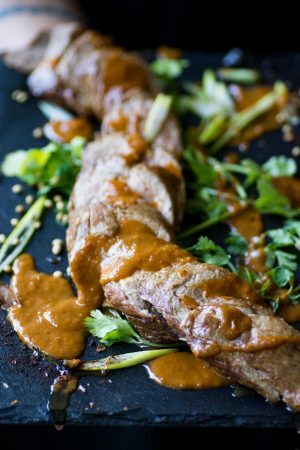 If you’re not a fan of cilantro, use scallions instead. Even ground coriander would work. 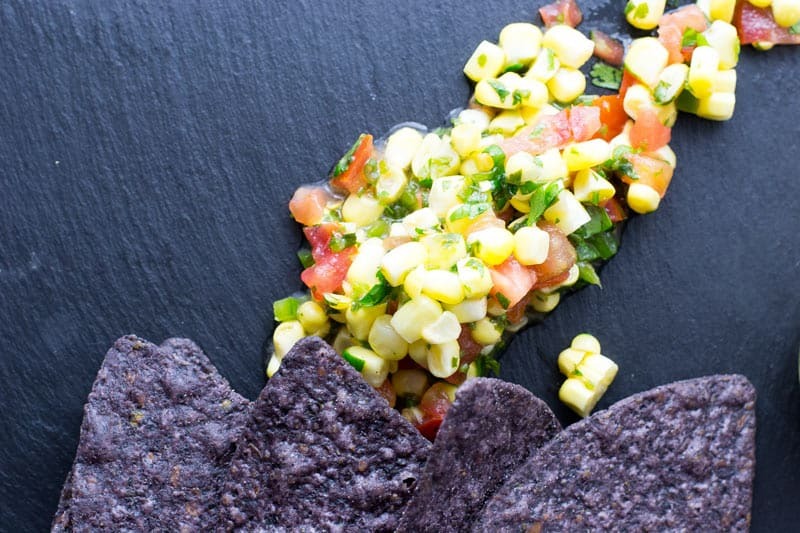 For a more traditional corn salsa, see if you can find blue or red corn locally. There’s a mild flavor difference, but the colors are beautiful. I paired this corn salsa with my Baja Shrimp Tacos. For another well-balanced meal, add the shrimp to a bed of chopped iceberg lettuce, with a big scoop of the salsa on top. Pair the salsa with an equally light Mango Aqua Fresca. 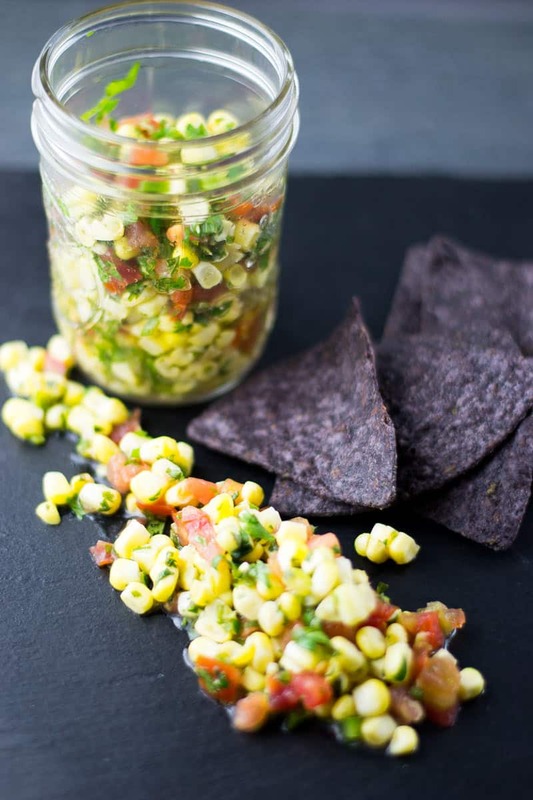 Sweet corn salsa with jalapeno and lime. In a large bowl add two ears of shucked corn. Add two teaspoons black pepper. Chop one stem scallion and add to bowl. Fold in agave and lime juice. Fold in chopped Roma tomatoes and jalapeno. Transfer to serving bowl and refrigerate for five minutes before serving. What a fabulous flavor combo! I love fresh corn – this looks like a great way to use it! This salsa looks delicious! 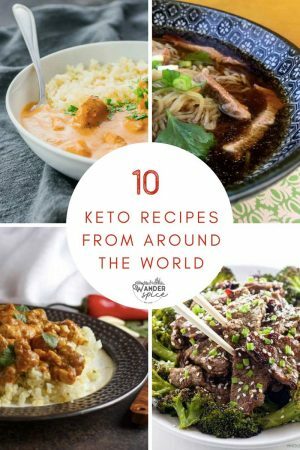 It would be a great addition to fish or meat dishes.